Visali and Shree See America! March was a month of new experiences for two lucky 11th graders. Through the support of our partners at Tufaan Entertainment of Northwestern University, Shree and Visali traveled to the U.S., sharing their stories and enjoying a unique opportunity to explore Chicago, Seattle, and New York. 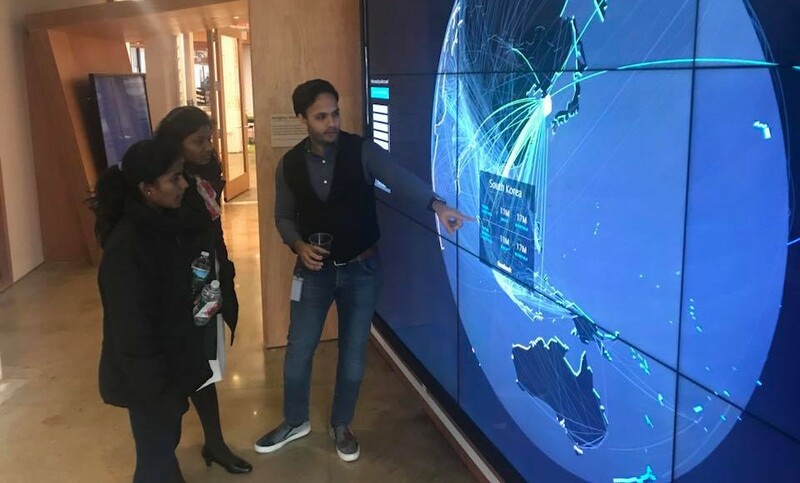 In Seattle, Visali and Shree spoke at Amazon, Microsoft, the University of Washington, and at a special screening of Daughters of Destiny for Seattle-area supporters. In addition, they toured AirBnb, ArenaNet, the Seattle Aquarium, and Pike’s Place Market. Finally, in New York, the girls met with friends and supporters of Shanti Bhavan, spoke at Facebook, held a dance lesson at Societe Generale (courtesy of our partners at She’s the First), and attended the show Carousel on Broadway (thanks to our partners at Broadway’s Babies)! Friends and supporters also held small events and get-togethers for the girls at their homes in each city, helping the girls understand that many people believe in them and are rooting for their success. After Shree and Visali arrived back at Shanti Bhavan, they gave a presentation to the entire school about their travels and shared with everyone what they had learned. Thank you all for your continued support! Your passion and dedication to Shanti Bhavan are what make once-in-a-lifetime moments like these possible!